Will Charters Save the New Orleans Schools? Note: This is part of a week-long series on New Orleans, five years after Katrina, based in part on my recent rip there. Is it possible that Hurricane Katrina, for all of its devastation, also did residents a favor or two? A lot of people who follow education policy think so. In the aftermath of the storm, state officials began what is now widely considered the nation's largest and boldest experiment in education reform. And there are signs that the experiment is working, although the results are far from unambiguous. Prior to Katrina, New Orleans had one of the nation’s most famously troubled school systems, with management that was, at turns, incompetent and corrupt. (A former school district president eventually pled guilty to taking six-figure bribes in order to steer contracts to a particular vendor.) It showed in the performance of students, which was generally dismal, although scores had started to improve in just the last few years before the storm. To be fair, educating the children of New Orleans was a huge challenge, for reasons far beyond the district’s control. Over the years, white flight to the suburbs and private schools left a student population that was overwhelmingly African-American and overwhelmingly poor--a case of separate and unequal, if ever there was one. But frustration with the district’s performance became so intense that, even before August 2005, the state was taking remedial action, creating a special district, called the “Recovery School District,” to take over failing schools. Katrina decimated the New Orleans schools, as it did all the city’s services. But instead of simply rebuilding the old schools, and putting the old school board back in control, the state decided to stage a near-total takeover--putting the majority of city schools under the Recovery School District’s Authority. The old district, the Orleans Parish School Board, maintained control over only a few. In part because the redevelopment of New Orleans was so uneven, particularly in the first two years, the state decided to institute school choice across the entire district--turning it into the largest full choice system in the country. More important, the state also made chartering schools easier. Today more than half of the city’s public schools are charters, run by philanthropies, entrepreneurs, or local universities. Every charter is its own enterprise--making individual decisions on contracting, purchasing, and hiring. What about the teachers' union? Its contract with the district expired in 2006 and was not renewed. The experiment has been highly controversial, as you might expect. To get some first-hand impressions I decided to visit the Thurgood Marshall-UNO High School--which, as the name suggests, is a charter that the University of New Orleans (UNO) runs. I’m hardy an expert in education reform. (For that, you’ll have to read my colleague Seyward Darby.) But I’ve been in enough struggling schools to recognize one that is suffering from neglect and poor management. Thurgood Marshall is clearly not one of those. The school operates out of an old building about a mile north of French Quarter, but the facility is in obviously good shape, with fresh paint and working equipment. (The only exception I spotted: A broken clock that hung askew in one of the hallways.) What impressed me more, though, was the culture that administrators and teachers have created within those walls. Thurgood Marshall is an “early college” high school and all the students are expected to classes at UNO, which is nearby. The commute is two-way, since the administration brings in a steady parade of UNO students to talk about their classes--and the possibilities that await these children if they are serious about their studies. It would be journalistic malpractice to read too much into those two interviews, particularly since I conducted both in the presence of Andre Perry, who is chief executive officer of the UNO charter network and among the area’s best-known promoters of charter schools. But, in an essay that Perry co-wrote for the Brookings New Orleans Index at Five report, he presents evidence that schools are performing better across the district. Among other things, he notes, test scores are (mostly) rising faster than they did before Katrina. But even if you take those statistics at face value--and, honestly, I can't say whether you should--caution is in order. That's particularly true if you’re trying to draw broader lessons about charter schools and their ability to improve performance in struggling, low-income school districts. The New Orleans school system was so dysfunctional before Katrina that virtually any change was bound to be a change for the better. And when the state took over the schools, it had some help. 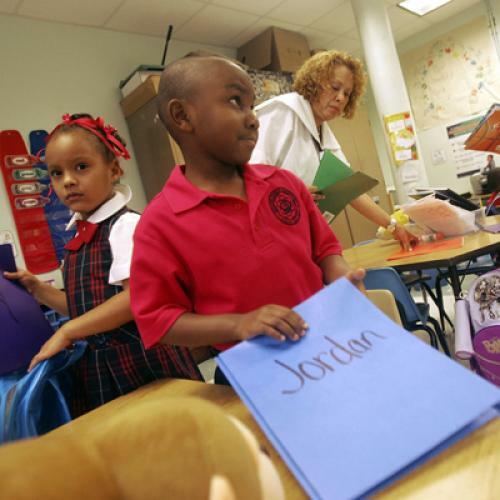 Before Katrina, per pupil spending in New Orleans was about equal to the state average. But in 2007-2007, per pupil spending in New Orleans was more than 50 percent higher than the statewide average, largely thanks to an infusion of federal dollars. Simply put, it's hard to know to what extent the money, rather than the reform experiment, explains the recent strides. And that’s to say nothing of the familiar questions about the charter school movement (questions, again, that my colleague Seyward knows better than I do). Particularly if you’re looking at individual schools that perform well, you’re looking at a student population that benefits from self-selection. There’s a waiting list to get into Thurgood Marshall; every child there has a parent sufficiently committed to their child’s education to have picked out a good school. You expect those students to do well. But what's happening to the rest? At least one analysis, a report by researchers at the University of Minnesota, suggests they're not doing so well. But if it’s too early to say that charter schools are saving the New Orleans schools, it’s not too early to say that they’re serving many students well. And, given the circumstances, maybe that’s reason enough to feel good. Update: I added some links and tweaked the first sentence, just in case readers thought I was saying Katrina left the city better off. Clearly, it did not.